Roberts has introduced us to a new and rather fascinating take on time travel, which others have explained far better and in more clever terms, but it basically uses an item, in this case Brainstorm’s briefcase, using the quantum engines in some manner, to transport the holder back in time. With the duplicate the Lost Light gang acquired they are able to make haste and follow, their party number only limited by spark type and…I assume, who might have a past version waiting on the other end. In most other media I have encountered time travel it is done using a machine, or even a blue box, where anyone inside gets to go sightseeing through time and space. I rather like Roberts downsized version, simply because it’s new and different. 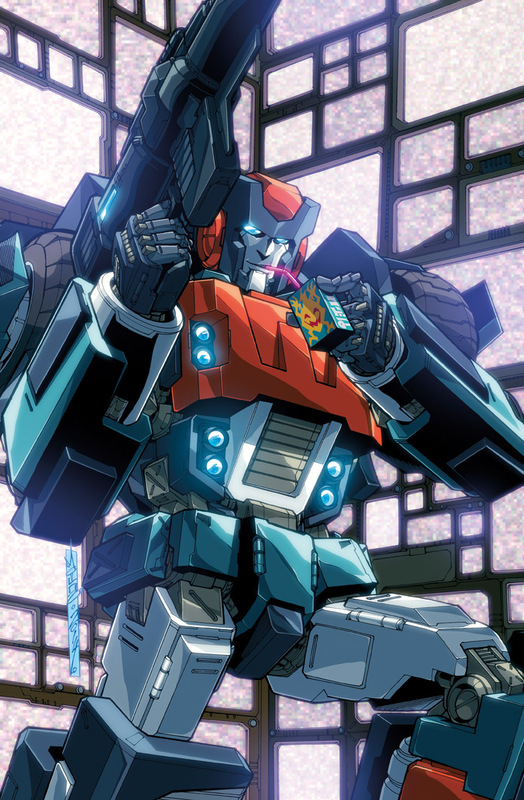 But yes, with time travel there is the whole paradox thing which must be dealt with and Rodimus holds a little speech where he stresses how important it is that they do not try to change time. After all, they are after Brainstorm who is very much altering time in some way, going by the previous flashes to a different past or the alterations in Rewind’s databanks. It’s too bad Rodimus is the worst at following his own advice, when he gets a chance to try and stop Trailcutter ending up like he did. So yes, the main content of this issue is a bunch of our Lost Light guys meeting up with Orion Pax and his buddies 4 million years ago and helping them protect some baby sparks from the senate and their goons. And thanks to a “time phone” Rodimus brought along (and then drops) we get a very lovely and heart clenching long distance through time conversation between Old Man Megatron and Young and Feisty Orion Pax. Seeing Megatron reach out to someone who was once rather important to him, but whose present day self is so far away from him that this sort of honest conversation is impossible was very touching. Essentially, it felt like Orion giving Megatron a sort of pep talk (“keep writing” “you should join us”) reminding me of that imagery of a little angel on your shoulder, giving you the best advice (where perhaps Ravage could represent the little devil). I have said it before; I rather adore what Roberts is doing with Megatron. Then, after a hairy scene where Roller plays hero, perhaps even dying in the process, the call comes through that Brainstorm has jumped again and the gang must give chase. And Chromedome quickly handshakes all Orion’s gang’s most recent memories away before they leave. So, not really tons of plot, but the character moments were as always brilliant, not just the Megatron-Orion moment, but also Rodimus flailing when he breaks his own rules (only to be thwarted when Trailcutter insists on shaking Chromedome’s hand before they zap away), as well as other minor moments, like the glee Whirl expresses at being allowed inside Brainstorm’s special armory. And the bit with the baby sparks possibly being tampered with makes me mentally reassess the idea of sparks as only an analogue to our human hearts, it seems they are more than just a beating heart, but also contain what makes a Cybertronian unique, including special powers. Heart, soul and genes, all rolled into one shiny package. See how much you can get from a comic, even though the plot of an issue can be summarized in just one (long) sentence?